Sign up now to become a Pipeline Member to get FREE unlimited article access anytime, anywhere. Your FREE membership includes access to exclusive industry research and analysis, reviews, interviews, blogs, and other premium content from Contact Center Pipeline. Members also receive exclusive early access to Contact Center Pipeline and Contact Center Ideas and Innovations Tour events. 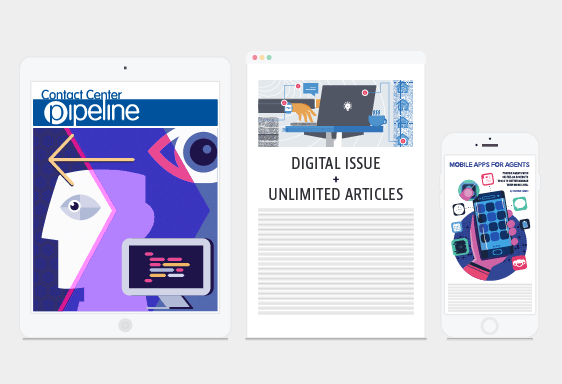 Upgrade to a paid subscription to get all of the benefits of Contact Center Pipeline, including our monthly print or digital magazine. If you need help with your order, visit our customer service page, or for immediate assistance (M-F 9am-6pm EST), contact us directly at 443-909-6951.